Why Won't You Refer Me To Others? The career of a successful financial advisor is self-fulfilling. 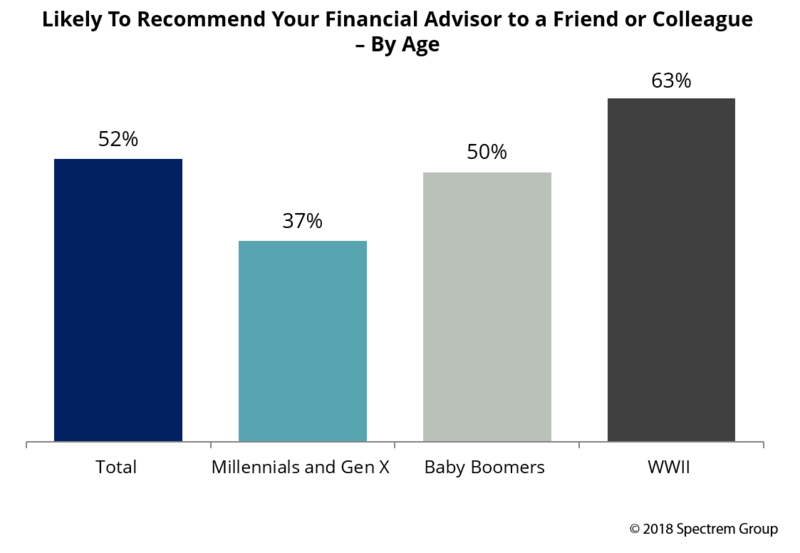 A majority of advisor clients come from referrals, and successful financial advisors succeed because their clients refer them to other people in need of advisory services. But not all satisfied clients offer referrals to friends, family or business associates. It’s not exactly hit-or-miss, but it is surprising the percentage of affluent and wealthy investors who do NOT refer their advisor to others. Spectrem’s study on the relationship between investors and advisors tells just how investors feel about their advisors in terms of trust and satisfaction. Advisor Relationships and Changing Advice Requirements offers investors the opportunity to explain their feelings towards their advisor, with an eye toward assisting advisors to understand how investors think. The wealthiest segment of investors in the study are the Ultra High Net Worth investors with a net worth between $5 million and $25 million (Not Including Primary Residence). Among that group, 82 percent profess to be satisfied with the overall performance of their advisor. So one might think that 82 percent of UHNW investors are willing to refer their advisor to other investors who want to find someone to work with. But only 65 percent of UHNW investors willingly refer their advisor to others. Furthermore, only 52 percent of UHNW investors said they were likely to ever recommend their advisor to friends or colleagues. In Spectrem’s Perspective Client Loyalty Among Affluent Investors, half of all affluent investors who do not refer their advisor to others say they don’t feel it is their place to tell others what to do or where to go for services of any sort. One third claim they don’t even think about it as something a normal person would do. In Advisor Relationships and Changing Advice Requirements, investors were asked to define the qualities which create trust between an investor and an advisor. Eighty percent of UHNW investors said they trust their advisor when the advisor shows that he or she is looking out for the best interests of the client rather than concentrating on fees or commissions to be earned. Two-thirds said trust is earned when the advisor is proactive in calling the investor to discuss current events that could affect investments, and 46 percent say trust is earned by charging appropriate fees for services rendered. Trust is a factor in creating a long-term relationship, and the older an investor is, the more likely they will be in a long-term relationship with their advisor. Sixty percent of investors from the World War II era, those born before 1945, have been with their advisor at least 10 years, but only 52 percent of Baby Boomers are in a relationship that has lasted that long. Of course, the length of a relationship depends on when it started, and many younger investors wait until they have accrued enough assets to warrant an advisor before entering into a professional agreement. Referrals are the lifeblood of a financial advisory service. A majority of new business comes from a satisfied client suggesting to a friend or family member that they consider using their own financial advisor. But there is a significant percentage of satisfied investors who do not offer their own advisor to others. Advisors cannot demand that their satisfied clients refer them to others, but there is not harm in asking a client to suggest their services to others. It can’t hurt to determine why an investor would not refer their advisor to others, just for understanding. All of that being said, a majority of investors do refer their advisor to others. While that does augment your business, there is a certain pressure to satisfy the new client in order to validate the first client’s recommendation.